It was 36F when I got up yesterday morning, above freezing, but last night, we had a definite frost. And I have ten tomato plants that I started from seed already stuck in the garden. I never seem to time it right – some years, I’m way early, some years way late starting my tomatoes. I like to push the season – having your own tomatoes by 4th of July is an undeclared but fierce competition over here in the upper Eastern Shore’s farm country. But the increasingly unpredictable seasons have made the calculation about when you start seeds and when you can actually put plants in the ground more complicated. Normally, our last frost date here is about April 15 or so. Clearly, we’re in a new normal, hard enough for gardeners, but the farmers and the CSA growers, who plant out in the fields, have it way harder; with our smaller scale, gardeners can do all kinds of things to protect our tender plants even if we’ve miscalculated the timing or if the season’s unkind. To help deal with the vagaries of climate change, ingenious gardeners and commercial enterprises have developed a host of strategies to cope. Like Walls o Water (a trademark, though I think there are similar kinds of things now with different names). Walls o’ Water are clever little season-extenders (actually more like season-precursors since you use them at the beginning not the end of the season). They’re translucent plastic cuffs about 15 inches tall, ringed with vertical channels that you fill with water. Once filled and in place around a plant, they absorb the sun’s warmth and retain enough overnight to protect against nights like the past two. They can be a bit awkward to deal with when you’re filling the channels and then lifting them into place, but they work well once installed. To make filling and moving them easier, I put an empty Wall o’ Water around an empty 5-gallon bucket, which acts as a stiffener, then fill each channel with the hose. Once filled, it’s easy to lift the filled wall, still ringing the bucket, into a garden cart and haul it out to the garden. However, lifting it into place over the planted tomato plant is a little tricky (two sets of hands help – again, thanks, Sweetheart). My tomato plants were desperate to get into the ground, but I knew – thank you, Marty Bass — that we were potentially in line for frosts. While the soil thermometer indicated that the soil was borderline OK to plant some of my overgrown Solanaceae babies, the air temps were iffy and what was up ahead was potentially destructive. But the tomatoes either needed repotting or planting. So, bit by bit over several days last week, my husband, Gary, cleared some beds (bless his heart), and I planted ten tomato plants – Big Mama, Supersauce, Big Rainbow, Mandarin, Sungold, Green Envy, grape, Sunchocula, Gold Medal and Super Beefsteak – inside Walls o’ Water. 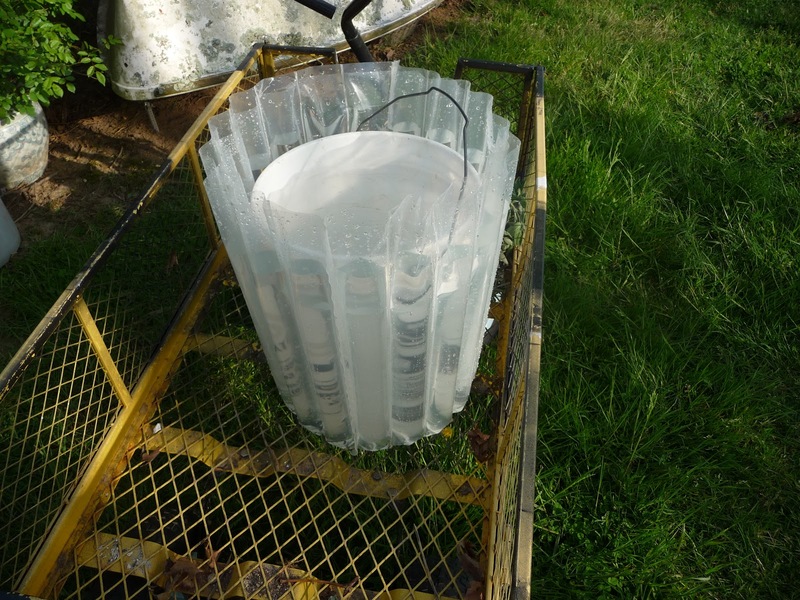 Once the Walls o’ Water were in place, I put metal tomato cages over the whole rig, which also helps to keep everything in place when the wind’s blowing 40 as it was the other night. Spent yesterday evening weeding the tiny spinach, carrots, and radishes as well as and the space around the tomatoes; everything was still thriving. So far so good. Most of them have about 6 inches of top also sticking out of the plastic protections, so we’ll see as the day wears on whether last night was too much for their bare little arms. If so, I’ll clip off the frost-burnt bits and keep going; tomatoes can be amazingly resilient if you give them a little encouragement. More tender plants will go in next week when the weather (presumably) settles down a bit. Can’t wait to bring in the first tomatoes in town! ← Local produce, eat it part. I and a couple of other people are doing a side by side comparison of super sauce and big mama. I would be interested in hearing what you think of Burpee's Super Sauce tomato. Well, all I had for protection was to wrap floating row cover around my tomato plants (planted in community garden plot end of last week, when you'd think it would be safe) and most of them are dead now. 😦 This is how it goes some years, but oh dear, it always hurts when you raised them from seed (and gave away all your extras). Kent, that's why I've tried Supersauce: to compare. I love Big Mamas. Meaty, fat, and it only takes a few to fill a quart jar, which makes the job go so much faster and easier. (I also squeeze out the juice after peeling and slicing them in half and use it to make V-8). Big Mama's are also less susceptible to some of the things my beloved heirlooms — Big Rainbow, Purple Cherokee and others are. If the Supersauce are better, or if they are even larger and less juicy, I'll use them to make spaghetti sauce, salsa, harissa, and whatnot. Erica, I may have a couple of extra plants. I could bring them to you for MG training day if you like if you'll be there. All of mine that aren't in the ground are dying to go in and show it. I'm hoping to get the rest of what i need in the ground this week and weekend, and I have a bunch for friends who have a cafe in the Adirondacks who can't put anything in until after Memorial Day, but I should have some going spare… let me know. That's so nice of you, Nancy – I know other people who have extras, so don't worry about it. And I have 2 'Iron Lady' transplants (new from Cornell breeding program with purported resistance to late blight, early blight, and Septoria leaf spot). I can bring them next week to ATD. Love it, Anonymous! Haven't heard of Iron Lady, Jon. What's the fruit look like? Have you eaten any? 1. put wow around plant before filling (with hose or watering can with “rose” removed). Once filled, the wow is like a wet noodles and a 2nd pair of hands are not always available. 2. if the tomato is of proper transplant size then an inverted 5 gal bucket should fit over the top, and the wow will fit around it. This prevents wow from collapsing on your plant during filling. Remove the bucket once the cells are filled. 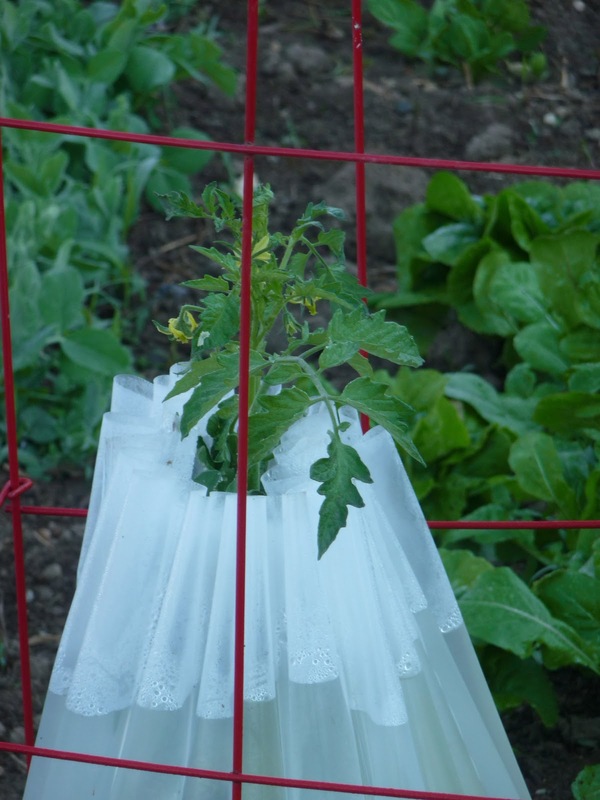 3. even better, buy a small tomato cage with the top hoop about the size of wow, but place it upside down around plant with wow around it. Leaving it in place will prevent collapse. Don't forget that wow works just as well on any sensitive plant such as pepper and eggplant. Final suggestion for those pushing the limits: a week before planting, dig a nice hole (at least 1'x1') to encourage warming of the soil around your roots. Excellent list, George. Many thanks. I'll be really interested to hear your experiences with Supersauce. So far, mine don't seem to be as resilient as Big Mamas. I'm hoping they'll perk up, but the plants are not as robust-looking, and while I've had about a peck of tomatoes off the Big Mamas, which are now about 3 feet tall, the Supersauce are about half the height and not nearly as dense, and they have not yet produced a single tomato (I picked off the first green ones that has started before I got the poor things into the ground). What's going on with yours over there? How do the Iron Ladies look? I've trialling 3 grafted tomatoes sent to me that I'm looking forward to tasting. Costuluto genovese, which I've grown as heirlooms off and on for years, and two that I'm unfamiliar with (and that I'd have to good look at the half-buried tags of to bring their names to mind.